Workplace fire safety is an important issue. On average, each year, UK work premises fires claim around 20 lives, injure around a further 1400 people and cost businesses around £3.5 billion. You can ensure you business complies with legislation by following some common-sense guidelines explained to you by Wright Safety Solutions, and who will conduct if necessary a Fire Risk Assessment. This will reduce the risk of your business joining these fire statistics. What fire risk do I have? Note: that as well as air there are other sources of Oxygen. It can be released from oxygen gas cylinders, and also from chemicals known as oxidising agents like peroxides, nitrates. Compressed air when released can in effect be a fresh supply of oxgen. If any of these oxgen sources are present near a fire they will aid combustion and make a fire more severe. The employer is responsible for the provision of fire emergency plans and maintenance of adequate fire safety precautions. The employer and his responsible employee must conduct a fire risk assessment and provide the measures necessary to prevent fire or control the risk of fire. The responsible person has a duty to protect the fire brigade by providing a site plan and information about what materials are on site, explaining how and where it is stored. Wright Safety Solutions can conduct Fire risk assessments for factories and building sites, and this will follow the recommendations of PAS79:2012 and The Regulatory Reform (Fire Safety) Order 2005. The responsible person, either on their own or in co-operation with any other responsible person must as far as is reasonably practical, ensure that everyone on the premises can escape safely in the event of a fire. The responsible person has a duty to ensure that escape routes are kept clear and comply with regulations with regard to doors and signage. All staff should have training, preferably in the form of fire drills. The purpose of fire extinguishers is to enable a small fire to be attacked to prevent it spreading. 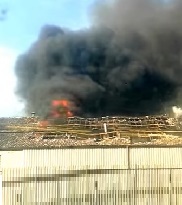 Factory premises must not be allowed to burn due to risk of spread to neighbouring properties, therefore employers will need to ensure there has been training on the correct use of fire fighting equipment. All this means: businesses will no longer be policed by the fire service on whether they are following the regulations – it’s up to the employer. AND in event of a fire and investigation if a business is found to have been negligent in one or more areas then the employer or his responsible person will be prosecuted. ...... then you need to act now to ensure you have a suitable and sufficient risk assessment in place.